B.O.P.P. 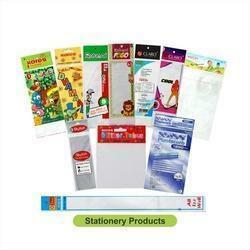 Bags For Stationery are available with self-adhesive strip which ensures these do not wear out quickly. With these bags ideally suited for packing stationery products, we can offer these in different colors and design options to choose from. Further, these bags also come in light weight finish and can be reused numerous times. Here, our expertise also lies in making these bags available with customized printing support as demanded by the customers. A reliable and innovative manufacturer and supplier, Arora Plastic Industries came into existence in the packaging industry in 1987. We are the leading and creative manufacturer of repertoire of printed packaging products such as PP Bags, BOPP Bags, Adhesive tape pouches. etc. Offered product portfolio is highly demanded and used in the market for wide range of packaging applications. Due to their long life, attractive look and cost-effectiveness, offered packaging material have become preferred choice of customers. The success of our organization is determined by maintaining standard industrial practices that supports clients’ requirements, optimum utilization of resources and significant investment in advance technology & business.